Although The Gombos Company was created in 2015, the Gombos family and our management team are no strangers to the hay export business. In fact, we have been working and excelling in the U.S. alfalfa export industry since 1978. Our vast experience allows The Gombos Company to excel as a leader in the global alfalfa market. 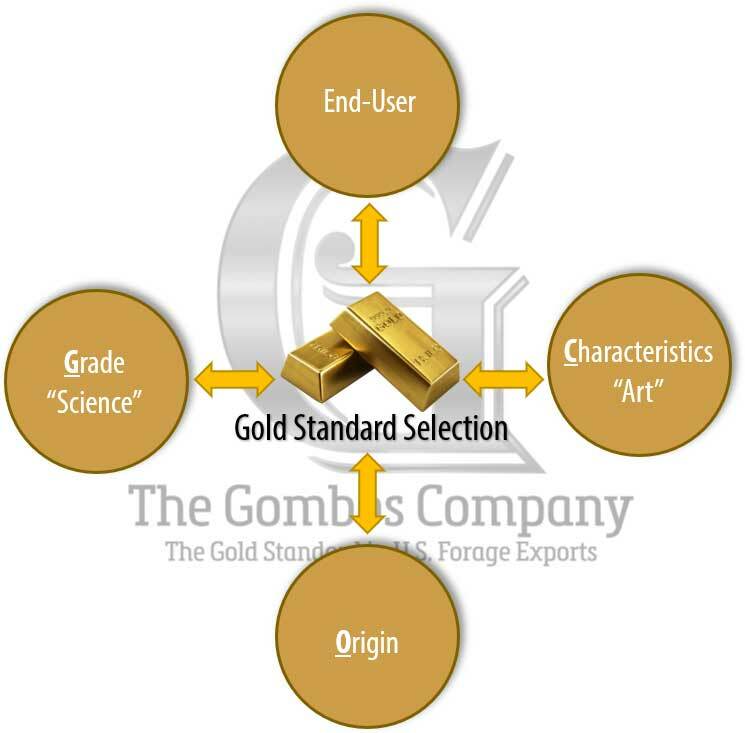 Value-added product differentiation sets The Gombos Company apart from others. Our ability to properly grade alfalfa and position supplies for consistent, year-round delivery is our specialty. We take into account the science, art, growing-region, and end-user requirements to ensure Gold Standard alfalfa selection for any global market. While there are quite a few reasons that allow us to do this, the most important is our efficient network of suppliers—our hay supply chain. At The Gombos Company, we know that the forage export industry is highly competitive. Our commitment towards providing quality forage has made us stand out among the competition. Regardless of the grade ordered, we always employ our Six Forces of Quality Control to ensure traceability and quality control from the time of purchase at the farmer’s field through final delivery at the overseas dairy farm. Furthermore, all alfalfa is thoroughly inspected, moisture is tested, and quality is graded. Core samples are taken at the origin farm per the National Forage Testing Association (NFTA) guidelines. All core samples are then sent to NFTA certified laboratories for nutritional analysis. The Gombos Company has partnered with some of the finest producers of alfalfa and other forage products through Vertically Integrated Alliances (VIA) and long-term relationships. Whether we purchase hay through VIA partners, seasonal contracts, or on the spot market, we only purchase from reputable growers who meet export quality alfalfa criteria. Our growers must also be able to provide harvest and field records in accordance with USDA and export guidelines. Our deals with growers are dependent more on relationship and ability to put-up export quality alfalfa than any other factor. 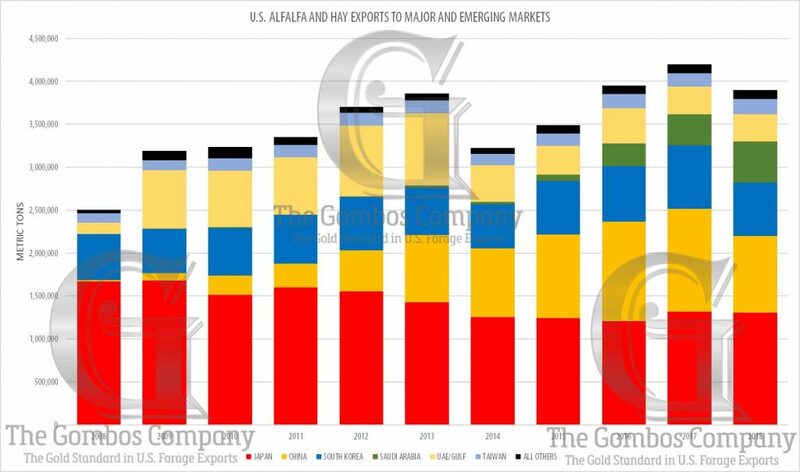 The increasing demand for forage by major importers requires expertise in inventory planning and positioning. The vast industry experience of the Gombos team enables us always to have sufficient quantities to fulfill our customer orders on-time, month after month. This ability is something that has helped us in capitalizing on the gaps created by increased demand and supply. 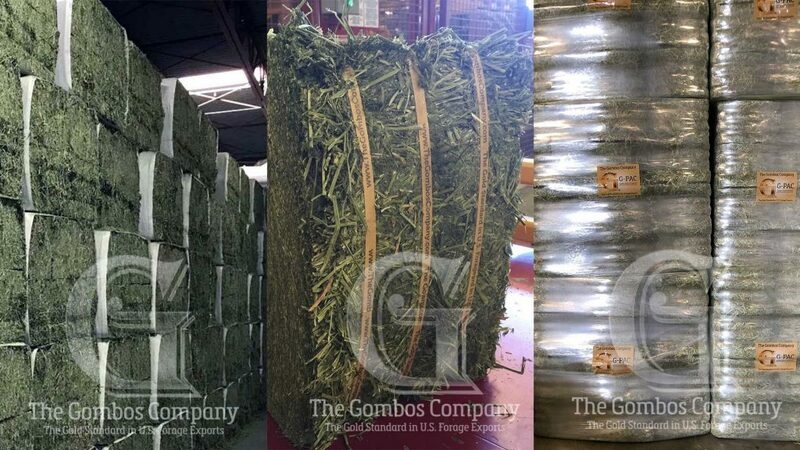 The Gombos Company uses the Hunterwood FC 10000 (Natural) Hay Press. “Natural” press means there is no blending-down of different quality products and there is no chopping or elevating and dropping of hay during the production process. Natural pressing preserves leaf attachment as well, and allows us to send alfalfa hay to overseas dairies that is very similar to the field-fresh alfalfa bales as fed to dairy cows in the United States. The Gombos Company is not your conventional exporter of forage. We are a company adapted to contemporary marketing strategies to channelize our business even better. The usage of digital means to increase our reach is something that we are proud of in the hay export industry. And, we use a variety of digital marketing tools and cloud-based systems to stay competitive and justify our reputation as the Gold Standard, value-added forage exporter. Our packaging standards are just as stern as our quality standards. We go to great lengths to minimize shrink and ensure alfalfa is not wasted due to packaging problems. We have the 450kg Mag Bale sleeve as well as smaller bales (30Kg, 60Kg, and 120Kg) always made just-in-time according to customer shipping schedule requirements. We also have G-PAC™ (wrapping) for small bales to increase handling, storage, and delivery efficiency. All bale packages are loaded into 40’ containers at 22.5-26MT depending on port of origin to ensure maximum weight and minimal waste. Mentored and led by founders John M. Gombos and Michael N. Gombos Jr., The Gombos Company is a family unit and a hands-on team of industry experts with over 300 years of combined alfalfa export industry experience. Our President, Mr. Chris Carrow, manages PNW alfalfa sales and exports; our VP of Operations, Mr. John E. Gombos, manages Pacific Central Division (PMW) and alfalfa sales and exports; and our Vice President and General Manager, Mrs. Aya Kitamura, manages PSW alfalfa sales and exports. In addition, we have our Chief of Sales in China, Mr. Jason Wang (Wang Song) who provides in-country sales and customer support in every province. We also have our Sales Manager – MENA Region, Mr. Tamer Taman who provides Middle East sales and support through our partner, Alliance Food Security Holdings, UAE. Finally, we have our highly-skilled and talented support team working together in acquisitions, inbound and outbound logistics, accounting and finance, marketing, and information technology to ensure that the whole is always greater than the sum of its parts. The Gombos Company fully understands its commitment towards community and society. Collectively and individually, we have always cared about those around us who do not have the same means or privileges. Afterall, agriculture is not just a job, it’s a way of life, and everyone who works in agriculture everywhere in the world are hard-working people who mostly rely upon divine providence to thrive and prosper. We do our best to provide tangible and intangible, caring support and, as always, the Gold Standard in U.S. forage exports.